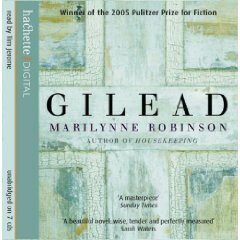 I read Gilead for the first time right when it was still fairly new and decided to listen to the audiobook to refresh my memory because I want to read Marilynne Robinson’s new companion novel, Home. For those who aren’t familiar with it, Gilead is an old minister’s letter to his 7-year-old son. The minister, John Ames, is dying, and in his letter he shares his family history, his thoughts on God and theology, and his reflections about the people of his family and community. There’s no action to speak of; this is a story about people—who they are and how they think and feel. Gilead is one of those books that I love almost too much to know what to say about it. The writing feels authentic, and Ames’s reflections are both moving and thought-provoking. I don’t think I’ve mentioned before on this blog that I’m working (very, very slowly) on a master’s degree in theology, and this book makes a better case than I ever could for how our theology and philosophy influence the way we think about and relate to one another—and how our relationships and our circumstances shape our theology. I’m not much of a fan of novels that are labeled Christian fiction (and despite its subject matter, Gilead is not marketed as Christian fiction). Most books I’ve read that are marketed as Christian books are too interested in promoting a particular reading of scripture or a particular understanding of God. That is absolutely not the case with Gilead. Ames himself is a Calvinist, but he seems to acknowledge the difficulties within the Calvinist position and has taken the time to thoughtfully consider other points of view, including those of atheists like Feuerbach. This is a book that recognizes that God is a mystery, and any attempts we make to tie God down to our definitions will be lacking. In discussing predestination, Ames says, “I’m not going to force some theory on a mystery and make foolishness of it, just because that is what people who talk about it normally do.” Amen and amen. Some of you may be wondering whether non-Christians would get as much out of this book as I did. I’m afraid I can’t really speak to that, since my reaction is so deeply wound up in my faith. However, this book did win the Pulitzer Prize, so there must be some universal appeal there. Although the audio version was fine for a reread, I would not recommend the audio version for a first read. For me, audio just doesn’t lend itself to the thoughtful kind of reading Gilead requires. Robinson’s prose is straightforward and clear enough, but there’s so much spiritual meat here that I suspect many readers, like me, will want to stop reading entirely and just think for a while. I love Gilead so much. I, too, want to read Home before the end of the year. Robinson’s writing is sooooo beautiful. I loved Gilead and I’ve just read Home and loved it too. I should put up a review of Home I suppose but I’m behind in my ARC reviews and battling illness right now. I would say that Gilead discusses some aspects of spirituality but it is not, in my mind, religious. The principles John Ames describes and tries to live up to apply to us all. Much of what he talks about is history and family. He just happens to be a minister and their families have the same problems as everyone else. People really should not miss reading it. Or Home, which will surely be an award winner. I enjoyed your review. I absolutely loved Gilead. I kept having to slow down so I could appreciate the writing more. I think the thing I loved most on the second time through was the gentleness that allowed the reader to see the conflict at the heart of the novel without needing to pretend we don’t all take part in that conflict. Inequality, race, generational problems, all fall within that profound struggle with mystery and forgiveness, and we all do it. Gorgeous book. I also loved Housekeeping. Have you read that? 3M: Thanks! I haven’t gotten a copy of Home yet, but I’m putting myself on the list at the library. I’m very eager to read Boughton’s story. Sandra: For me, the theological dimension made this book stand out–especially since it’s unusual to find contemporary books where the preacher is an intelligent and good guy. However, I think you’re quite right that the family conflicts, the racial problems, etc., are universal problems and that anyone can find something to relate to here. Jenny: Yes, there’s a wonderful undercurrent of grace in here. We’re all guilty in some way, but we’re also all beneficiaries of grace. It’s lovely. I haven’t read Housekeeping–it’s on my shelf, though.